It’s fair to say that this year is going to be the biggest one of Paul Bettany’s career. As well as appearing once again in the Marvel Cinematic Universe as Vision, 2018 also sees him debut across in the Star Wars franchise, where he appears in May’s Solo: A Star Wars Story. While he remains completely sworn to secrecy in relation to the fine details behind both projects (his Solo character has still not yet been revealed), he did manage to drop a few hints about the secrecy and scale of the filming that is being put into the production of Avengers: Infinity War. Bettany sat down recently for an interview with Total Film, which the magazine published in last month’s publication. The majority of the topics that were covered in the piece were in relation to Solo, and the new cinematic adaptation of Journey’s End (which is released this month), but Bettany couldn’t help but chat to the interviewer about the filming of the upcoming Marvel epic. The recent teaser trailer that was revealed for the movie has already showcased just how much Bettany’s Vision will play an integral role in the Infinity War story. His character is shown in a new human form, continuing to build on the (uncomfortable) romance he had struck up with Elizabeth Olson’s Scarlet Witch back during the events of Captain America: Civil War. There’s also the small fact that Vision happens to be in possession of the Mind Stone, which Mad Titan Thanos needs to fully complete his legendary Infinity Gauntlet. 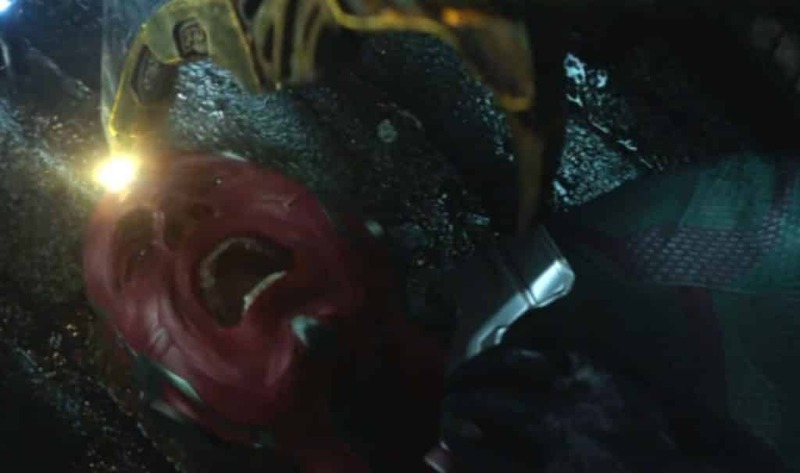 The footage appears to show a sequence in which a member of Thanos’s Black Order (potentially Corvus Glaive) brutally removes the stone from Vision’s head by force. Over in Solo, it’s believed that Bethany’s character is an intergalactic gangster, and possibly the villain of the piece. Under original Solo directors Phil Lord and Christopher Miller, Bettany’s role was initially planned to be totally CGI, with Michael K Williams providing the dialogue. When the two Lego Movie directors were fired, and replaced by Ron Howard, Bettany was then bought on board to play a human version of the character for the movie’s re-shoots. Infinity War will land in theaters on May 4th, with Solo: A Star Wars Story due to be released the a little after on May 25th. Avengers: Infinity War: Mark Ruffalo Teases The End Of The Hulk?